Tower Grove Farmer's Market in Tower Grove Park takes place every Saturday, April 14th through November 17th. The market is located at the Roman Pavilion, west of the playgrounds and fountain. Join the many local shoppers that attend the market each week who come for local fresh food and unique art and wares. Stay for the live music, free yoga and other activities. 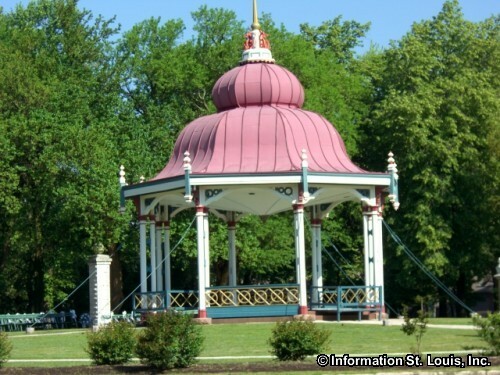 Plus explore the beautiful historic Tower Grove Park. An Evening Farmer's Market happens on Tuesday evenings, 4-7pm, May 8th through October 16th. See website for more information. Tower Grove Park, a 289 acre park, was originally part of Henry Shaw's vast prairie estate that also included what is now Missouri Botanical Garden. In 1868, Shaw donated the park as a gift to the citizens of the City of St. Louis with the stipulation that it would always remain a park. Modeled after the many pleasure parks Shaw studied in Europe, Tower Grove Park features a playground, children's wading pool, picnic sites, beautiful early 20th century pavilions, athletic fields for softball, baseball, soccer/football and corkball; plus horseshoe pits and tennis courts. Visitors can also enjoy carriage and pony rides by reservation and Sunday Brunch at the Cafe Madeleine. The park also hosts many festivals and events throughout the year. Directions: Tower Grove Park is located between South Grand Blvd and South Kingshighway Blvd, south of Interstate 44, and can be accessed from both those streets and from Arsenal Street and Magnolia Avenue.